Our Corporate Payroll Card provides you with unparalleled flexibility, unified visibility and centralized control over your income and finances to help you manage your salary. 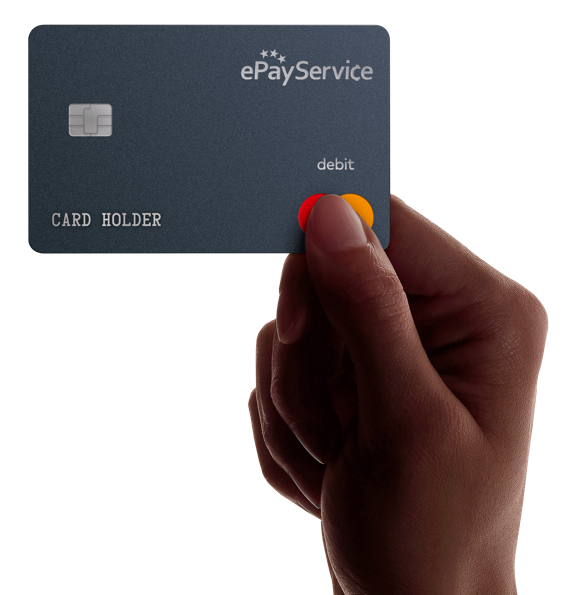 If you are employed at a remote location or if you require the flexibility to travel while you work, then our ePayService Mastercard® is the card for all your everyday payments and income collection needs. We understand how to reduce the cost and time to receive your earned income. At ePayService we can easily manage your corporate payroll liquidity effectively and efficiently through a range of products and services. We can help businesses and their employees streamline their payroll processes, providing cost effective management of your employees’ income. Quick & Easy Online Application! It takes just 2 minutes to complete our application form and open your ePayService account. Your login and password will be sent to you via email. For account activation and approval customer documentation and verification is required. Your first ePayService Card will be automatically issued free of charge. Just choose your shipment service from our available carrier list and receive your card. Log into your account online or on your mobile apps. Use your password to log into your account. Change your card settings or check your balances via web or mobile apps. Activate your card online and select or change PIN number. Please try not to forget your PIN. Congratulations! Your card is active and ready to be used. Just charge your card from the web or mobile apps and enjoy it!